Snowmobile Trail Updates Thanks Missy! ITS 89 North – Groomers went last night and will go again tonight. One note of caution, at the end of Hannafords bog (after the airport) just before the dump road there is an open water hole. We have filled it in as best as we can, but use caution. ITS 89 South Groomer went last night and will go out tonight. Trail conditions are very good. ITS 88 to Rockwood Groomer will go to Rockwood tonight. Conditions are still good,reports are coming in favorable. Just watch for water holes. Border Riders North Groomer will groom tonight. Should be in good condition. In Town Trails Groomers will go out tonight, they should be in decent condition. Again, remember do not snowmobile on plowed roads, especially Bald Mountain and use caution on the Rockwood trail signs are still being placed. Also, The trail maps should be completed for 2009 this week but in case you do not get one, just follow the signs. Last years map is still pretty accurate EXCEPT ITS 88 off of ITS89 North to Pittston. That trail no longer goes on Bald Mountain. And there are loggers out there so please, watch for signs on the trails. We are lucky to receive daily trail updates from the Missy who works with the Border Riders Club. Below is her report from today. Trail maps will not be available until next week so I have heard. Also, due to the tree harvesting around bald mountain, the trail is different so it is a much longer ride to Pittston Farm. Just something to keep in mind until the maps and signage is completed. ITS 89 North – Groomers did not go last night, due to the rain. Imagine there is still plenty of snow. Will update you as soon as I hear something. They did break the border open on the 26th, so it is groomed to the border. ITS 89 South I-m sure plenty of snow, but watch for open water holes. ITS 88 to Rockwood Not sure – should be ok will update you as soon as I hear something. Oh, please remind riders that the signage is really poor, and looking for someone to go sign the trail. Border Riders North Should be in good condition. In Town Trails If anything this is the place where the snow will be thin. The groomer did make it thru the bog on 12/25 so, it should be ok.
Report that Canada is groomed, Rockwood open, Piston open, Bulldog open. I imagine everything is in good condition, as I have not heard anything bad. Also, just to let everyone know there is a local trail thru John-s to Cedar Ridge, which you could do a loop, it is being maintained privately. Just again, remember do not snowmobile on plowed roads, especially Bald Mountain and use caution on the Rockwood trail signs are still being placed. Not sure if the groomers will go out tonight or tomorrow, the rain probably just settled the snow. Thankful that the sun it out today and the rain has passed. We had a wonderful evening last night with friends. We hope you all did too. Part of our tradition is sharing of the Christmas wafer (Oplatki) on Christmas Eve with family and friends before dinner. Even Murphy was part of it. 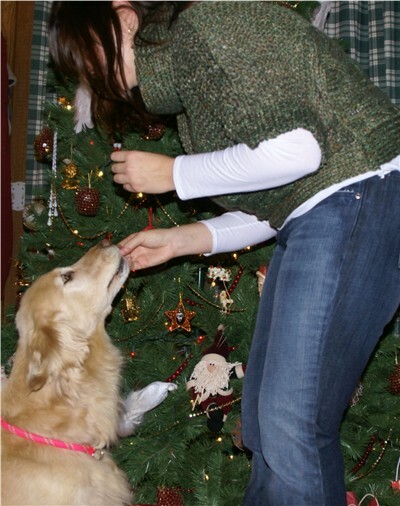 Below is a picture of Melissa wishing Murphy a wonderful 2009 full of tennis balls and friends. Today, Christmas day is a day to spend indoors, at least here in Jackman. Although our thermometer says 20, it is very windy and blustery out there. So we hope all of you are warm and spending time with family and friends and that Santa brings you everything you asked for. Melissa took some group shots last night which I will post when I get a copy. SO check back in a couple days for an update. We have some dear friends coming over to share in this but we will also be thinking of our families and friends who live elsewhere and of those who are not with us anymore. We always set an extra setting for any wanderer or extra person who may need food or shelter this evening. This is a time of love, sharing, and forgiveness. So we wanted to say to you all, Wesoly Swiat (Merry Christmas) and may you all have joy, peace and good health in the new year. As for the trails, the groomers have been working hard on the trails. Just like everywhere in town, there is a lot of snow to move on the trails too so some areas, may be only one lane this week. 3pm As promised earlier in the original post, here are some pictures from first thing this morning. This one picture below-poor Murphy had no where to go pee. The snow was just too deep for her to get out there to do her thing. SO she went in the snow on the deck. At this point, snow is snow right? It does not matter where it is. 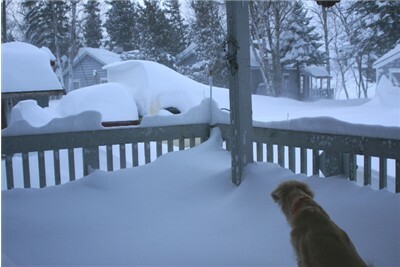 9am I am sure all of you know that a Nor-easter hit Maine last night. 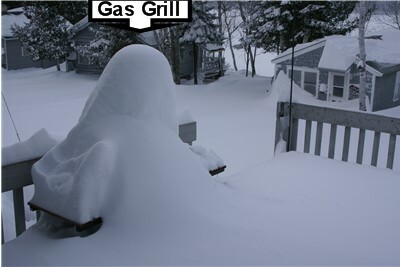 WOW ❗ It started here around 4ish yesterday and by midnight, it was almost to the top of our gas grill on the deck and 3/4 way up the deck rails. We really should-ve started clean up last night. Somewhere along the night, the winds started so this morning, there is not only about 3 feet of snow (hard to tell exactly what fell) but also some 5 foot drifts in our driveway. I just looked at our web-cam and it is really hard to tell or for you to see the amount of snow out there but trust me, there is a lot. I did try to get some camera shots but the snow is just too deep to get out there but I will upload a couple later on today agter we get some snow moved. The snowmobile trails were already in decent shape as of last week and many were up to ride. After this storm, riding is going to be fantastic. If you like to ice fish, there are quite a few ice shacks out on Big Wood Lake so even though some parts of the lake may not be thick, it must be safe enough in others. We still have a couple cabins open for New years so give us a call. BRRRR ❗ It is cold. Time to get my blood thickening going. The temp has been about ZERO past couple mornings and even still, now at noon it is only 2 degrees. But there is no wind and the skies are blue and the sun is shining. But if you are coming up to ride this week, use caution as trail work and signage is not complete and there are people out doing this. The trail master recommends you stay to the right, watch for culverts until we get more snow (especially 89S). ITS 88 to Rockwood is probably the roughest. Some areas are plowed. I am sure in town are are a little rough but they have been groomed so as of this morning, in good shape. 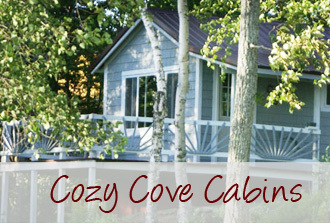 If you need a place to stay, give us a call at Cozy Cove Cabins. Spend Christmas with us even as I think we are definitely having a white one. Go to our chamber site for daily [url=http://jackmanmaine.org/maine-snowmobile-trail-report.php]Maine Snowmobile Trail Reports[/url]. Also, sending out a great big THANK YOU ❗ ❗ to Missy Newman (she is involved with the Border Riders club and other groups plus works at Jackman Power sports) for her trail updates. The long awaited completion of our renovation to Cabin 5 is about ready. We are in the final phase of clean up, curtains, bedding and details for the cabin. We still have not picked a name, even though we have a theme. Maybe the “5th” person to choose a good name will get 5% off or maybe 50% off…we will announce something if we do a contest of this sort. Anyhow, it will be available beginning in January so if you are interesting in a waterside cabin with a whirlpool bathtub, be sure to inquire about it when you make your reservation for 2009. It could sleep 4 but 2-3 we think would be best. With the finish work we need to do and the Holidays, I fear I will not be able to get our website updated with a description and photos but I will post a few shots here on the bloggie when I can. We are very excited about this cabin. It was done so totally from scratch and most even made by Steve. So keep an eye out. Just a note: the number 5 is big this year as we will celebrate our 5th anniversary here at Cozy Cove Cabins on the 5th of May; cabin 5 is new; and I will turn 1/2 century (or .5. So we will definitely have to do something with the number 5. Any ideas?